Monday&apos;s big election law news came from the Supreme Court&apos;s penultimate decision of the term upholding Arizona&apos;s congressional districts. But before handing down its last three decisions, the court made voting-rights advocates happy by deciding not to review a different election case. “Arizona citizens can continue to participate in voter registration drives without worrying about not having proof of citizenship documents," Shirley Sandelands of the League of Women Voters of Arizona said in a statement Monday. The case, Kobach, et al. v. Election Assistance Commission, et al., was about whether Arizona and Kansas could require voters to prove their citizenship when registering to vote with the so-called federal form. Kansas Secretary of State Kris Kobach led the suit against the U.S. Election Assistance Commission, which was an appeal of a lower court decision. Both Kansas and Arizona have state laws that require applicants to prove their citizenship when applying to vote with state forms (for state or federal elections). But the U.S. EAC denied the states&apos; requests to have their citizenship laws applied when would-be voters use the standardized federal form. The Supreme Court had already ruled in 2013 that state proof-of-citizenship laws couldn&apos;t be applied when people try to register with the federal form. The states&apos; direct request to the EAC was a last-ditch effort to get around that. "This is a very big deal," University of California Irvine Law Professor Rick Hasen wrote on his election law blog Monday. "Kobach had the potential to shift more power away from the federal government in administering elections toward the states," he added. In a joint statement , the League of Women Voters of Arizona and Kansas and the Brennan Center for Justice praised the court for "reaffirming the important role Congress plays in preserving a fair voter registration process across the country." The LWV, represented by the Brennan Center and several law firms, was a defendant in the case with the EAC. But Kobach still hopes states&apos; authority will be recognized. "Our position in court is that we’re exercising our state’s right to define the qualifications of electors," Kobach told CQ Roll Call Monday afternoon. "By creating this loophole, the federal agency is interfering," he said in reference to the EAC. 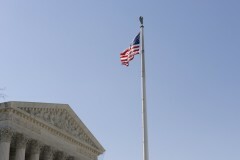 Kobach emphasized the court&apos;s decision not to review the case does not reflect its opinion on the issues of the case. "The Supreme Court decision not to review was not particularly surprising given the fact that there was no circuit split yet," he said. Typically, Kobach continued, "the Supreme Court favors reviewing decisions where one circuit has gone one way and another circuit has gone another way. It appears that the Supreme Court is waiting for another circuit to weigh in." He expects the 11th Circuit, which he said has jurisdiction over two states with similar proof-of-citizenship laws, to eventually get involved. The Kansas and Arizona laws stand, meaning that people wishing to register to vote with state forms are required to show proof of citizenship. Kobach said more than 99 percent of Kansans use the state forms. "But because of the Supreme Court decision not to review the case," he added, "we do have a small limited loophole." The slim majority that uses the federal form can "refuse to provide proof of citizenship," he said, "but that will only suffice for federal elections." Kobach said he&apos;ll be sending another request to the EAC, but that it will be presented differently from the state&apos;s previously denied request. "Every time an alien votes, it may not steal an election, but it will cancel out a vote of a U.S. citizen," Kobach said. Related: Supreme Court Upholds Arizona&apos;s Congressional Map Rick Renzi Appeal Denied, Limiting Congress&apos; &apos;Speech or Debate&apos; Immunity 5 Congressional Maps That Redistricting Could Change for 2016 Roll Call Race Ratings Map: Ratings for Every House and Senate Race in 2016 Get breaking news alerts and more from Roll Call in your inbox or on your iPhone.